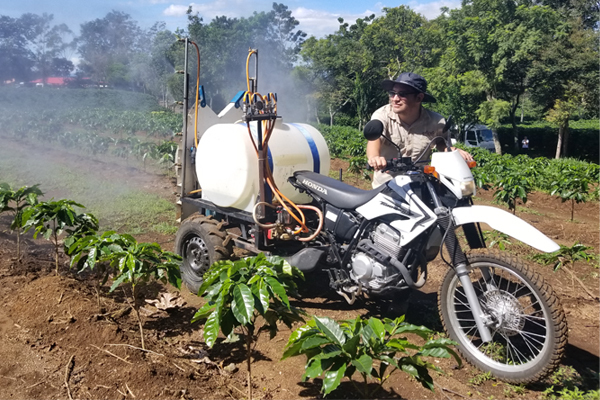 Potential for Mechanized Coffee Production in Costa Rica? This year’s Sintercafé conference was held 7-11 November in San Jose. Many of the sessions focused on sustainability, of course, such as “Transparency: Beyond F.O.B Price” by Eric Thormaehlen, president, Costa Rica’s Chamber of Coffee Exporters; “Coffee Barometer 2018” by Anthony Marten Herrera , communications officer and Ariana Araujo Resenterra, project officer, both from Sustainable Agriculture, Food, and Environment (SAFE) Platform, as well as “Rust Never Sleeps” by Dr Tim Schilling, founder and CEO, World Coffee Research. The keynote speaker, Daniele Giovannucci, president of COSA, stressed the importance of going beyond sustainability in his presentation, “The End of Sustainable Development – The Next Decade for Coffee and Agriculture.” COSA convenes global partnerships to further sustainability globally (governments, NGOs, associations, institutions, etc). Giovannucci began by asking the questions: Do we talk too much about sustainability? Are we doing enough about it? 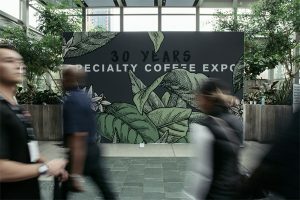 He proceeded to say that there are several negative trends occurring in coffee relating to sustainability, noting the price volatility and that the coffee industry is moving away from holistic methods and failing to address the multiple dimensions of sustainability. “There is an unfocused array of well-intentioned single-issue specializations,” said Giovannucci. 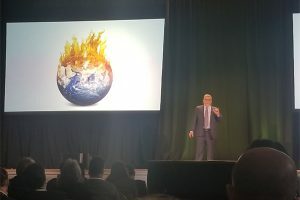 He said that specialization, while useful, is unlikely to generate the comprehensive sustainability needed to address the big systemic realities: that farming is unprofitable and the need for resilient farming systems in an alarmingly changing climate. Giovannucci also highlighted several positive trends such as consumer-to-origin connections (terroir, flavour, local culture, PGIs), how co-operatives are changing the game in certain growing regions, and data democracy or voice of farmers creating stronger relationships and better-targeted services. He also pointed out opportunities in technologies including big data and risk prediction, and field robotics (weeding, sensing, precision agriculture), which Giovannucci said is not yet being used in coffee — but, in fact, there is experimenting being conducted in these areas. Each year the organizers of Sintercafé arrange a field trip to a farm or beneficio in Costa Rica. This year we visited a research farm in Tarrazú (near the Poás and Barva volcanoes), operated by Icafé/Cicafé (Instituto del Café de Costa Rica/Centro de Investigaciones en Café), which, along with studying and implementing sustainable and climate smart coffee production, is testing mechanized farming methods. While mechanized farming is being used by many coffee farms in Brazil, it is not in Central America, given the size of most of the farms and the terrain. 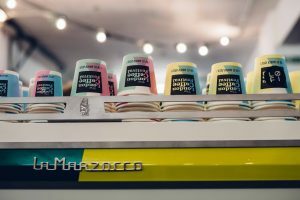 Researchers at Icafé/Cicafé are testing mechanized farming because of the lack of labour availability (fewer specialized labourers and increasing migration to urban areas), labour costs, which represent 30-35% of production costs, and labour efficiency. The rows of coffee trees in test areas are planted 3.5 meters apart (1.65cm between plants) to enable machines such as the one in the accompanying image to access the plants. The arrangements depend on the mechanical equipment used, but the main goal is to try to keep 5,000 plants per hectare. Mechanized farming methods can be applied to a variety of labours including tillage, foliar applications, fertilization, weed control and harvesting. The type of mechanization used will vary on each farm as it depends on the size of the farm as well as the terrain. The machine seen in the image above can switch from irrigation to fertilization. However, only 37% of farms in Costa Rica have the capacity to use mechanization but most of these farms do not yet have the conditions to mechanize. Of that 37%, far fewer will be able to actually mechanize. Mechanized farming in Costa Rica may only be in a test phase, but it is a start to helping improve coffee production in a country that was hit hard by the coffee leaf rust crisis in 2013, where 80% of the coffee varieties are still susceptible to coffee leaf rust, and whose producers are beleaguered due to the devastatingly low coffee prices, which show no signs of increasing anytime soon.